The U.S. 83rd Infantry blazed a trail of courage from the hedgerows of France to the Hürtgen Forest and wars end at the Elbe. The 83rd U.S. Infantry Division had been mobilized for World War I in September 1917. Its unit patch was a downward-pointing black triangle with the letters O-H-I-O stitched as an abstract gold monogram in the center. As the letters suggest, it had its origins as a mostly Ohio unit, although after the outbreak of World War II, there were boys from all over the nation in its ranks. Its Great War nickname was Old Hickory, but in World War II it became known as the Thunderbolt Division. The 83rd trained for nearly two years before it saw its first combat. Its three infantry regiments were numbered 329, 330, and 331. Along with the rest of the 14,000-man division, Frank Fauver, a telephone lineman with G Company, 329th Regiment, 83rd Infantry Division, crossed the English Channel and landed in Normandy, France, on June 23, 1944—two weeks after D-Day. It was the beginning of the 83rd Infantry Division’s entry in World War II’s European Theater of Operations. In 2013 Fauver spoke to WWII Quarterly. During these conversations Fauver remembered pieces of the past: the landing at Normandy, the battles for Brittany, central France, Luxembourg, then Germany’s Hürtgen Forest, the Battle of the Bulge, and the race to the Elbe. Time had dulled his memory somewhat, but the pain of war remained. “I was with frontline telephone communications,” Fauver recalled. “My job was to lay and maintain the wires that were right up front. At first I was scared to death, then after so many days up there at the front, we kind of came to the conclusion that we’re not going to get out of this alive and we’re going to give them Germans all we got. Then we didn’t worry about dying because we knew we were gonna. “When we got home,” he said, “we knew if we tried to talk to somebody, they wouldn’t believe what we would tell them anyhow, so we didn’t talk about it. I spent a lot of time having a beer with buddies, but even then we didn’t talk much about it. We didn’t ask many questions because we wanted to put the war behind us. The real horrible parts were pushed out; it would eat you up if you didn’t. Frank Fauver, photographed in April 1944. During Fauver’s service as a qualified lineman in telephone communication, switchboard operation, and telephone line installation, he said he installed some 11,900 miles of telephone wire needed between the commanders at regimental headquarters and the frontline troops as they battled German forces across Europe. Two weeks after the 21-year-old farm boy from Wauseon, Ohio, was inducted on October 13, 1942, he reported to Camp Perry, Ohio. After that it was training at Camp Atterbury, Indiana, then field training in Murfreesboro, Tennessee, and Ranger training at Fort Breckinridge, Kentucky. On April 6, 1944, Fauver and the division embarked on a 10-day voyage from New York aboard a British transport vessel named HMS Samaria. Fauver was seasick the entire trip; he recalled that halfway through the voyage, as he was “feeding the fish” over the side, he lifted up his head and saw a “thing” in the distance coming his way. That “thing” racing toward him was on top the water and looked like a big fish. Fauver remembered, “At first I thought it was a whale. I had never seen one, and so I turned around and said something to one of the sailors. I think he was the only one on deck. He took one look at it and never said a word to me. He called down to the quarters where they run the ship and gave a full speed ahead and a hard left turn. I found out it wasn’t a big fish but a torpedo skipping across the water. If I had not been on the deck that day, the torpedo would have gotten our ship. After disembarking at Liverpool, Fauver’s division moved to Wrexham, Wales. For two months the division trained in the Midlands and northern Wales, and then, shortly after D-Day, the 83rd was assigned to the First Army. Around June 20, the 329th Infantry boarded an LST (Landing Ship, Tank) bound for Normandy. Life would never be the same from that day forward. Fauver recalled that the seas were so rough in the English Channel that, as one man climbed down the rope to board the LST, he was crushed between the two vessels. Fauver said the man’s screams stayed in his head the rest of his life. Around June 26, the 83rd Division reached an area near Carentan, France, and took part in the hedgerow battles. The fighting in this sector, which was heavily defended by German SS, panzer, and airborne troops, was considered some of the most difficult of the war. The three-to-five-foot-tall and equally wide earthen hedgerows prevented Allied units from seeing beyond the next embankment and made the American tanks easy targets for antitank fire. 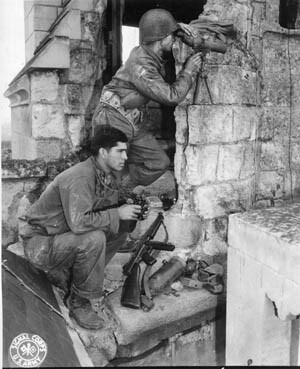 Soldiers of the 83rd Infantry Division occupy an observation post in France during the summer of 1944. Following the breakout from the hedgerow country of Normandy, that summer was one of tremendous gains and rapid movement. According to Goguen, “The 4th of July, 1944, will always live in our memories, especially in the ones of our 2nd Battalion.… On that day, the 83rd Division, as part of the VII Corps, attacked south of the town of Carentan.… The terrain … consisted of nothing but the hedgerows so typical of Normandy. In addition … the battalion was confronted by a swamp. Those who attempted to cross the swamp were either killed or left to bleed in the waist-deep marsh; few returned. Leaders and non-coms died gallantly in trying to lead their men to an almost impossible objective. “We began to feel the loss of our dead and wounded, for casualties were mounting rapidly. We wondered if every day of combat on this continent would be as terrible as those we had just fought. With hidden tears we hardened at the sight of our buddies lying dead along the embankments of the hedges. We cursed aloud as brave medics and litter bearers carried moaning soldiers with limbs torn off and others with loose flesh staining the stretchers red. We refused many meals, for the sight and smell of decaying human flesh and cattle was simply too much for our nervous stomachs. Once out of the marsh, Fauver worked at night stringing telephone wires along the narrow roads between hedgerows, which required the headlights and tail lights on the jeeps to be covered so only small slits of light would come through. Fauver also remembered that jeeps were driven with the windshields down. Vertical bars extending above the heads of jeeps’ occupants had to be welded onto the front bumpers because the Germans had strung wire across the roads neck high. “Some of the guys driving jeeps were getting decapitated from the wires if there wasn’t something on the jeep to break the wires,” explained Fauver. 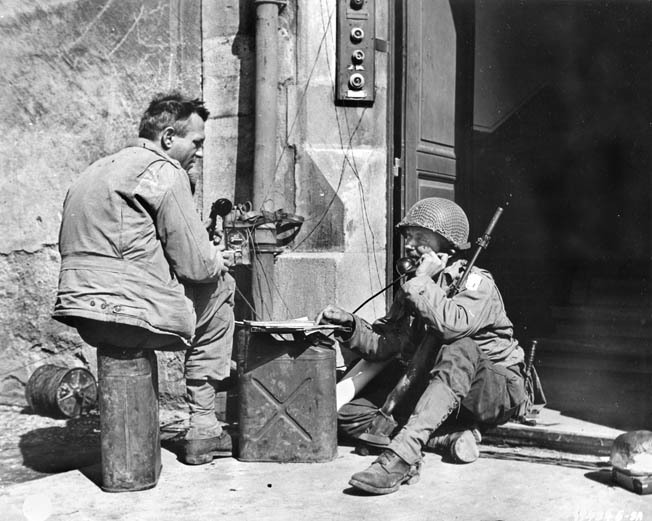 Situated in a doorway somewhere in France, a soldier operates mobile communications gear so that an officer can coordinate mortar fire during offensive operations. As a qualified lineman, Frank Fauver estimates he laid thousands of miles of communication wire for the Army. By now, the Allied juggernaut that had invaded France on June 6 was unstoppable. In his memoirs, Crusade in Europe, Eisenhower wrote, “By July 2, we had landed in Normandy about one million men, including 13 American, 11 British, and one Canadian division. In the same period we put ashore 566,648 tons of supplies and 171,532 vehicles…. During these first three weeks we took 41,000 prisoners. Our casualties totaled 60,771, of whom 8,975 were killed.” Also during this time, 400 members of the 83rd’s 329th Infantry died. On July 25, the Normandy breakout of the hedgerows, known as Operation Cobra, began near St. Lô. The Americans feinted toward the Brittany peninsula, tying up four German divisions there. The recently activated Third Army, led by Lt. Gen. George S. Patton, Jr., then moved eastward toward Argentan, while the British drove from Caen toward Falaise. Major General Robert Macon, commander of the U.S. 83rd Infantry Division, watches the effect of Allied artillery fire on the island of Cezembre, near St. Malo, France. U.S. intelligence estimated that between 3,000 and 6,000 German troops occupied St. Malo, but actually the number was closer to 12,000 defending the walled city. On August 6, the Germans demolished all the quays, locks, breakwaters, and harbor machinery and set fire to the city; then, on August 9, they retreated back to the citadel. Despite house-to-house battles, artillery fire, and fighter-bomber attacks, Aulock finally surrendered after his artillery and machine-gun emplacements were destroyed by direct hits from American 8-inch guns. The 83rd captured 12,393 Germans in this battle. After St. Malo, the 83rd moved to the Loire Valley to protect the entire right flank of Patton’s Third Army as it moved across France. The mission began on August 22 and lasted for about a month. The division’s zone extended from St. Nazaire eastward along the Loire through Nantes, Angers, Tours, and Orleans to Auxerre. This was a distance of more than 200 miles—the longest line of responsibility given any division in the war. 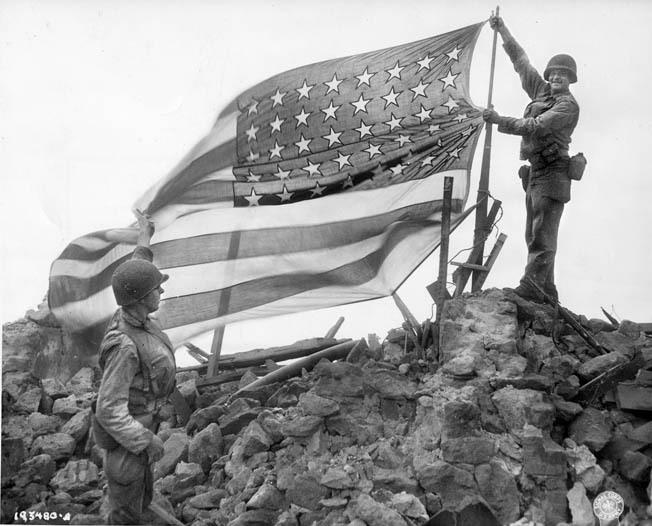 After the German garrison on the island of Cezembre has surrendered, soldiers of the U.S. 83rd Infantry Division raise the American flag in triumph. The island is located near the French city of St. Malo, where troops of the 83rd Division were also engaged. During the division’s month on the Loire, some 20,000 Germans, including Brig. Gen. Botho Elster, were captured; formal surrender ceremonies were held at Beaugency Bridge on September 17. General Elster handed over his pistol to 83rd Division commander Maj. Gen. Robert C. Macon, and then his 20,000 men marched to a prisoner of war enclosure—the largest mass surrender of the war of German troops to Americans. During the operation, the 83rd was transferred from Patton’s Third to General William H. Simpson’s new Ninth Army. “After that battle they moved us to Orleans, France. We were there for quite some time, just doing holding, and occupation, and reorganizing, and absorbing replacements and supplies so we would be ready. While we were there in Orleans, our intelligence went down across the river and did some reconnaissance. They ran into the Free French, the people who were against the Germans, who told them that some Germans down there would like to surrender. An open-turreted American M-10 tank destroyer fires on German positions in the French city of Orleans as a French civilian and an American spotter observe the action. The German garrison under General Botho Elster surrendered to the 83rd Division’s commanding general, Robert Macon, and 20,000 enemy troops marched into captivity. On September 24, the 83rd Division rolled rapidly eastward across France and into Luxembourg to take up positions along the Moselle and Sauer Rivers and relieve elements of the 5th Armored and 28th Infantry Divisions. The Battle of the Hürtgen Forest, the objective of which was to stop German forces from reinforcing the front lines farther north in the Battle of Aachen, was the longest battle on German soil during World War II and the longest single battle the U.S. Army has ever fought. The battle area covered 50 square miles east of the Belgian–German border and lasted from September 19 until December 16, 1944. The division historians noted in The Thunderbolt Across Europe, “Approximately in the center of the triangular area marked by Aachen, Duren, and Cologne lay the Hürtgen Forest. It was here that the men of the 4th Infantry Division were fighting, fighting and dying. In this thickly wooded forest, Jerry easily concealed himself and his weapons. It was a forest filled with death. There were many Heinie snipers; there were machine guns, mortars, and camouflaged and entrenched Nazis with rifles and burp guns. 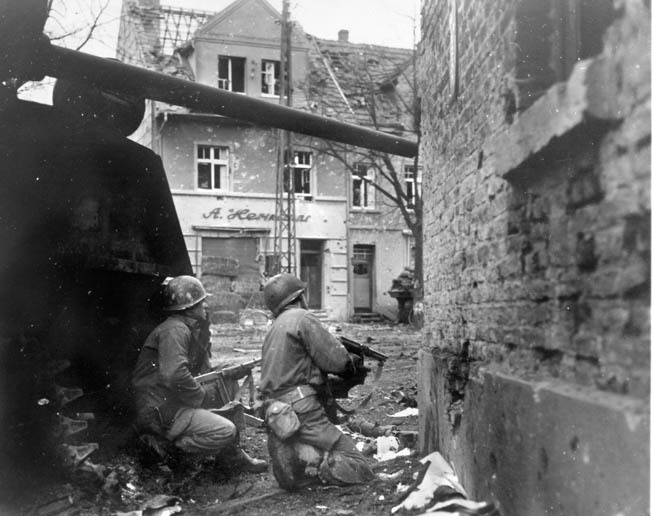 On December 17, 1944, as the German juggernaut rolls forward during the Battle of the Bulge, two infantrymen of the American 83rd Division, both armed with Thompson submachine guns, peer around a corner in the rubble-strewn streets of Gurzenich, Germany. Jack M. Straus, another veteran of the 83rd, wrote in We Saw It Through: A History of the 331st Infantry Regiment, “On December 6, we gave our positions along the Moselle Valley to the 22nd Infantry of the 4th Division. We then moved by truck to the Hürtgen Forest east of Aachen to relieve the battered men of the 12th Infantry [of the 4th Division] in this densely wooded area of hell, mud, and snow. “In this cold and depressing forest, we were greeted with Nazi propaganda leaflets which informed us we were ‘given a damnable Christmas present by being transferred to the famous Aachen sector where fighting is harder than anywhere else. It’s all woods here. They are cold, slippery and dangerous.’ They reminded us—‘Death awaits you behind every tree. Fighting in woods is hellish.’ But it took more than these silly notes to dampen our spirits. Even the nightly ‘serenades’ of enemy heavy artillery and their devastating tree bursts and intensive strafing from the Luftwaffe could not make us buckle. Still it was plenty tough, about the roughest experience we had since Normandy. It wasn’t enough that we lived in holes roofed with logs, ate K rations with a hot meal only once each day. Our feet got numb and our hands got blue from the wet and cold. 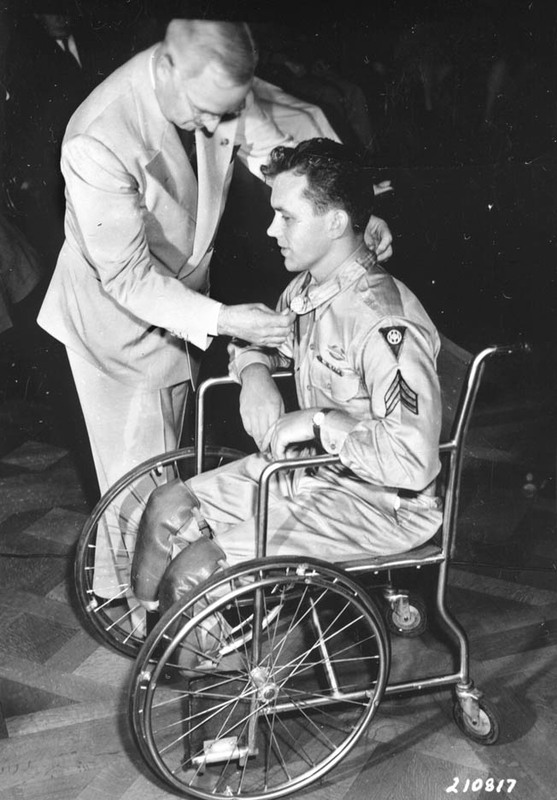 Confined to a wheelchair due to injuries sustained in combat, Sergeant Ralph Neppel of the 83rd Infantry Division receives the Medal of Honor from President Harry S. Truman. The Germans were desperate to keep control of the Hürtgen because it was to serve as a staging area for the Ardennes Offensive (which became known in the West as the Battle of the Bulge) that was already in preparation, and the mountains’ access to the Schwammenauel Dam at the head of the Rur Lake (Rurstausee) which, if opened, would flood low-lying areas downstream and prevent any Allied crossing of the river. 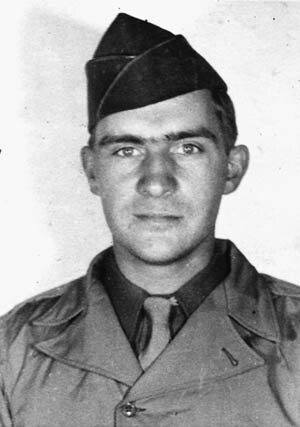 The 83rd’s official history noted that the division’s “most distinguished hero of World War II was Sergeant Ralph G. Neppel of Gilden, Iowa. He received the Congressional Medal of Honor for his actions on December 14, 1944, near Birgel.… Sergeant Neppel was a machine-gun leader who calmly ignored a German tank about to overrun his position. A shell blew off his left leg, but the sergeant held his position and, with grenades, wiped out 20 Germans. In this photo taken on January 11, 1945, soldiers of an 83rd Infantry Division reconnaissance unit trudge across the wintry landscape through the town of Bihain, Belgium, north of the crossroads town of Bastogne, which the Americans held against relentless German pressure. On December 16, 1944, the fighting that became the last offensive by Nazi Germany in World War II began. As the Germans advanced, a large salient or bulge was created in the U.S. lines, giving rise to the name “Battle of the Bulge.” The front was more than 50 miles across and, at one point, the deepest penetration by the Germans was more than 50 miles. From December 20-27, 1944, the Belgian town of Bastogne became a key part of the larger Battle of the Bulge. The goal of the German offensive was the harbor at Antwerp. Because all seven main roads in the Ardennes mountain range converged on the small town of Bastogne, control of its crossroads was vital to the German attack. And, of course, the 83rd was in the thick of the fighting. Although official records show that the 83rd Infantry Division was committed to the campaign at Rochefort, some 50 miles northeast of Bastogne and drove northeast of the town, Fauver swears he was close by. Fauver said, “Our objective was to drive a point toward Bastogne at the same time another division from the south was doing the same thing. We wanted to meet so the Germans would be trapped, so we kept driving, but when we were about one or two city blocks from Bastogne, the order came to hold up and not to take another inch. We could look into Bastogne and see the [trapped 101st Airborne] soldiers in there; wave to them, holler at them. “We wondered, ‘What’s going on?’ All we have to do is go down there and walk in with a rifle and there would be no resistance. About that time we heard a terrible noise from the rear, and here comes Patton’s Third Army. They rode up through and into Bastogne. Well, when the Stars and Stripes, which was our newspaper, came out, it said that Third Army did it all and that we weren’t even there. That didn’t go over very good. “The highway into Bastogne was terrible. The only way to advance was to follow the tanks on foot or in jeeps because they would pack the snow down. You couldn’t even walk on the snow; if you did you would sink in, it would bury you. So we followed the tank tracks to lay our telephone line. We would throw it up on the banks where the tanks couldn’t get them, otherwise the tank treads would chew them all to pieces. 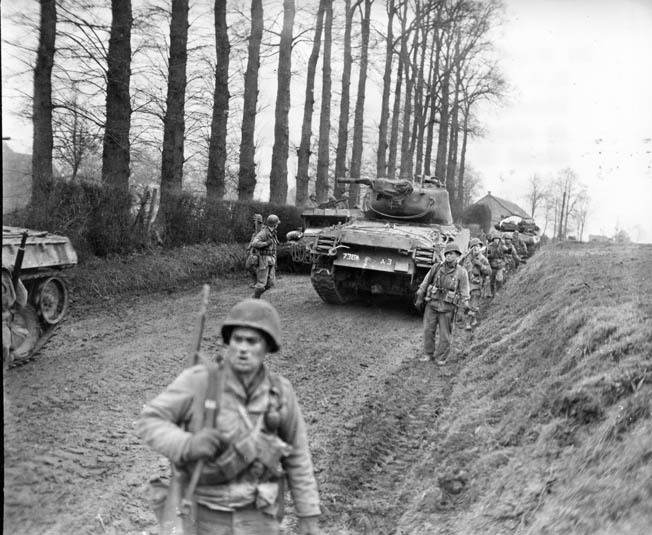 Infantrymen of the 83rd Division walk past Sherman tanks that have momentarily halted on a dirt road in Germany. This photo was taken in February 1945, and the war in Europe ended three months later. The Battle of the Bulge remains one of the longest and bloodiest battles ever fought by the United States, with 83,000 American troops committed, as compared to 200,000-250,000 Germans. Casualty figures for both sides are staggering. Nearly 21,000 Allied soldiers were killed, while another 43,000 were wounded and 23,554 were captured or reported missing. German losses numbered 15,652 killed, 41,600 wounded, and 27,582 captured or missing. 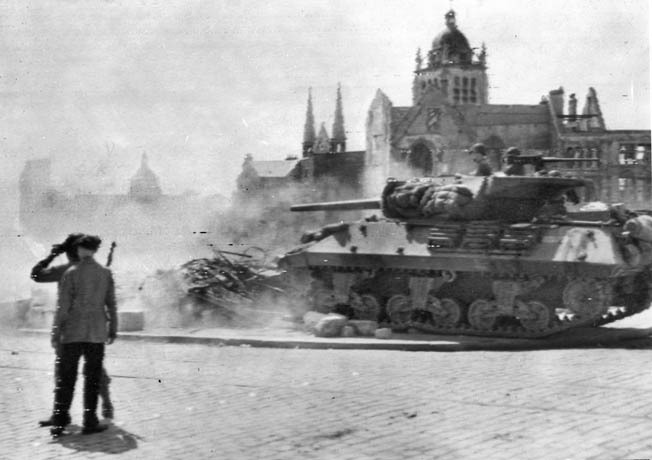 In addition, the Germans lost 1,400 tanks and 600 other vehicles. Like most combat soldiers in World War II, Frank Fauver had his share of close calls. Once, while installing phone lines at the front, a German tank shot out the bottom of the pole he was working on, which left him hanging on wires. Another time, a German mortar shell blew the front wheel off his jeep and shot a piece of shrapnel through a five-gallon gas tank in the back, which fortunately did not explode. Another close call came when he dove into a roadside ditch for cover from incoming artillery. A shell hit a few feet from him and blew a deep hole that completely covered him with dirt; his buddies thought he had been blown to bits. In all 270 days of combat and close calls, Fauver only received a small nick on his finger from flying shrapnel. The resulting cavalcade included many captured German vehicles, among them tanks, motorbikes, buses, and at least one fire engine carrying infantrymen and a banner on its rear bumper that read, “Next Stop: Berlin.” The division would not stop until it had secured a position across the Elbe River. In a span of only 13 days, the Thunderbolts fought their way across 280 miles of northern Germany as unit after unit within the 83rd leap-frogged one another to continuously press the attack eastward, outracing even armored units to the Elbe River. On April 11, 1945, elements of the 83rd discovered and liberated Langenstein-Zweiberge, a slave labor camp near Halberstadt that had been established a year earlier and was a sub-camp of the Buchenwald concentration camp system. The main Buchenwald camp, near Weimar, was discovered that same day by elements of the 6th Armored Division. At its height, Langenstein-Zweiberge held 5,000-7,000 inmates from 23 different countries. When the 83rd arrived, the Yanks found some 1,100 surviving inmates in horrific condition, some weighing only 80 pounds. The prisoners told their liberators that they had been forced to work 12-16 hours a day in the nearby Harz Mountains, digging what was to become a vast, underground factory for fighter planes and V-2 rockets. Those too weak to work were murdered. Life expectancy was only six weeks. Deaths occurred at a rate of 500 per month. One of the liberators from the 83rd was Dr. Kenneth Zierler, battalion surgeon with the 399th Armored Field Artillery. Alerted by two war correspondents traveling through the area, Zierler said, “They told me that there was a concentration camp nearby and that we could liberate it because, they had heard, the guards had fled two days earlier at the sound of our tanks rumbling down the road. They had demobilized themselves simply by changing into mufti and melting into villages. “The ambulance driver, Corporal Henry Mertens, the two newsmen, and I took off. The gate was open. There were no guards. 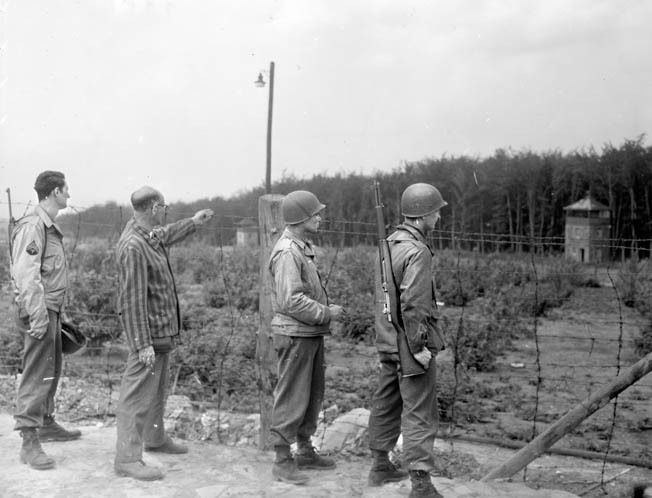 A handful of men, in the vertical-striped uniform of the concentration camps, had placed themselves near the gate, but no one had been able to bring himself to cross the line past the open and unguarded barrier to the world outside. Elements of the U.S. 83rd Infantry Division liberated Langenstein-Zweiberge, a sub-camp of the Buchenwald concentration camp system, on April 11, 1945. “As we descended from the ambulance, they kissed our shoes. We lifted them to their feet. These walking skeletons were young men, looking aged. They told us we were the first Allied personnel they had seen. Some were covered with lice. Their faces were drawn, pale and gray. Most of the living huddled in their huts on cots, too weak to stand. From a tree swung the corpses of two inmates, hanged just days before. No one had had the energy to climb the tree and cut them down. The doctor went on. “Those who were able to walk swarmed about us in a variety of moods, many speaking at once, or trying to. Some voices were so feeble we could scarcely hear them. Some seemed to be mumbling madly. Most blessed us, thanked God, wanted to know when there would be food, when they would go home. Elements of the 329th also came upon Eschershausen—an underground aircraft and tank parts factory, concentration camp, and slave labor camp—and freed some 6,000 inmates. Reaching the Elbe on April 13, 1945, the 83rd made the first Western Allied crossing of the river within 40 miles of Berlin. According to the Thunderbolt’s commander, Maj. Gen. Macon, the division “set an infantry record by racing 215 miles across four rivers in two weeks to establish and hold the only American bridgehead over the Elbe.” The 69th Infantry Division’s historic meeting with Soviet troops at Torgau on the Elbe did not occur until April 29, 1945. But first, there was a battle for the river crossing at Barby, 25 kilometers southeast of Magdeburg. The April 28, 1945, edition of the division’s newspaper reported that the 329th Infantry was in a “knock-down, drag-out” fight for the bridgehead on the west side of the Elbe. While the 2nd and 3rd Battalions were battling their way into the town against a force of about 600 German soldiers, an engine pulling 90 freight cars started to cross the railroad bridge but was quickly destroyed by American artillery. The Luftwaffe then made a rare appearance in the afternoon and began strafing the troops. The retreating Germans blew the bridge that night. One of the Yanks said, “The first thing I saw was a tremendous white smoke ring. That was followed by a thunderous explosion and billowing clouds of black smoke.” This was followed by an aerial bombing attack on 329th positions. The next morning the 329th resumed its attacks and, after a few hours of house-to-house fighting, the white flags came out. That afternoon, the first assault boats were paddled across the 150-yard-wide Elbe while under sporadic fire from the opposite bank. They did not get far. Because the 83rd was now within the Russian sector due to the new territorial lines drawn at the Yalta Conference in February, Fauver’s outfit was ordered to pull back from the Elbe. On May 6, 1945, the 83rd turned over its positions to the 30th Infantry Division. Ike’s decision was a sound one in terms of potential British and American lives spared; Berlin cost the Soviets some 300,000 casualties, including 70,000 killed. 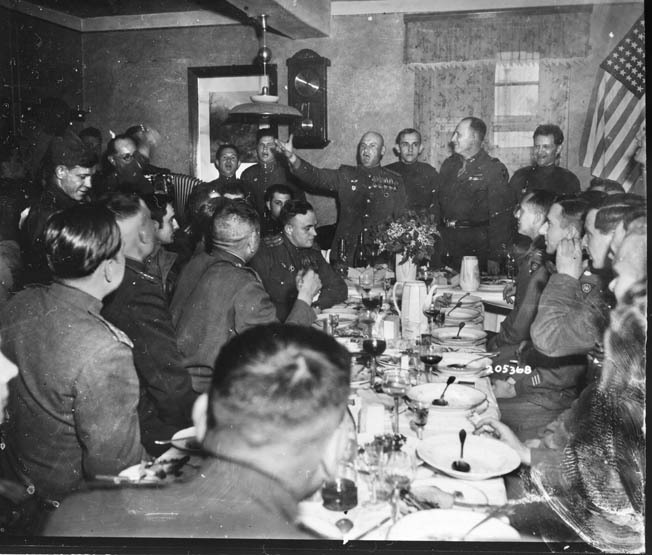 At Cobbelsdorf, Germany, near the Elbe River, officers of the 83rd Infantry Division are entertained by their Soviet Red Army hosts during a victor’s banquet in May 1945. According to terms agreed upon by Allied leaders, American soldiers halted their eastward advance into Germany when they reached the Elbe. The Elbe was where the war ended for Fauver, but it also left him with the feeling that the 83rd was forgotten. His division had given its blood and sweat; being prevented from reaching Berlin cut deeply. Fauver wasn’t the only one who felt this way. For years, veterans from the 83rd have argued that the division’s accomplishments were worthy of the Presidential Unit Citation, the highest award given to an Army unit. The division was nominated for the citation after Germany’s surrender but did not receive the award. The 83rd Division Association recently resubmitted its request in hopes that new documentation will bolster its case. Such a quest is a long shot, however. The standards for the citation, as defined by the Military Awards Branch, are quite high. The unit must have displayed such gallantry, determination, and esprit de corps in accomplishing its mission under extremely difficult and hazardous conditions as to set it apart from and above other units participating in the same campaign. Moreover, the citation is rarely awarded to a unit larger than a battalion. The officers of the association contend that the case for the 83rd merits a look, particularly for its actions in the closing days of the war in Europe. In all, the 83rd covered some 1,400 miles in its race across Europe. 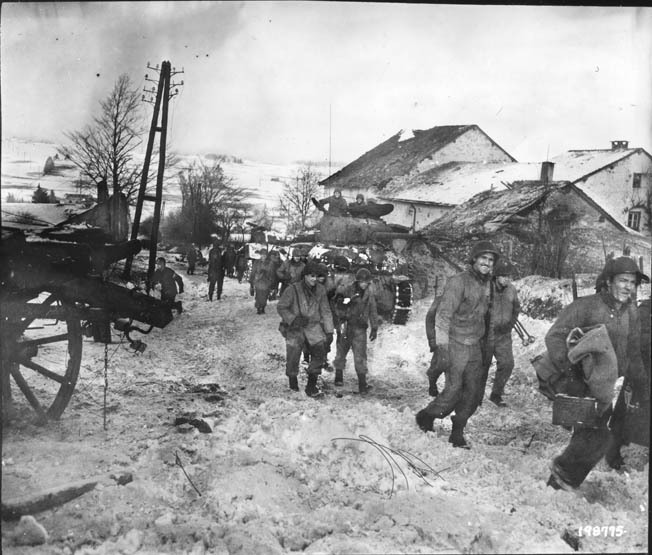 The division fought against 36 major units of German infantry, panzer, and parachute divisions in eight major battles and fired off almost 22 million small-arms and mortar rounds. The 83rd’s losses were heavy, with 3,161 killed in action, 11,807 wounded, and another 459 who died from their wounds. Overall, by war’s end the men of the 83rd Division were awarded one Medal of Honor, one Distinguished Service Medal, five Legions of Merit, 798 Silver Stars, 34 Soldier’s Medals, 7,776 Bronze Stars, 4,747 Purple Hearts, 271 Medical Badges, 20 Meritorious Service Unit Plaques, and 106 Air Medals. They were honored with 18 British awards and 65 French awards and credited with destroying 480 enemy tanks, 61 enemy planes, 29 enemy supply trains, and 966 enemy artillery pieces. At war’s end, Maj. Gen. Robert C. Macon told his Thunderbolts, “To those of you who fought in Normandy, Brittany, the Loire Valley, Luxembourg, the Hürtgen Forest, the Ardennes, and during the drives to the Rhine and over the Elbe, there is no need to relive the experiences encountered or to remind you of the inspiration set forth to us by those of our comrades who were killed or wounded. 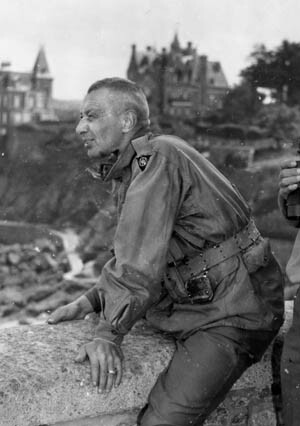 Fauver remained forever proud of his division and its considerable role in the Allied victory in Europe. He received the Expert Infantryman Badge, the European Theater of Operations Medal with five battle stars, the Bronze Star, the World War II Victory Medal, the American Theater Service Medal, and the Good Conduct Medal. He died in February 2014, just two months shy of his 92nd birthday, shortly after being interviewed for this article. The stories of the boys of the 83rd—and all who served in World War II—are fast disappearing as the veterans pass away. They all deserve to be remembered. Tags Allies, Avranches, Battle of the Bulge, Brittany Peninsula, Buchenwald, Concentration Camps, Dwight D. Eisenhower, Elbe River, English Channel, European Theater, General George S. Patton, General Omar Bradley, Good Conduct Medal, hürtgen forest, luftwaffe, Luxembourg, medal of honor, memoir, Nazi Germany, Normandy, Old Hickory, operation cobra, Red Army, Sherman Tank, Silver Star, Stars and Stripes, U.S. Third Army, Walter Model, War Correspondent, Yalta Conference.